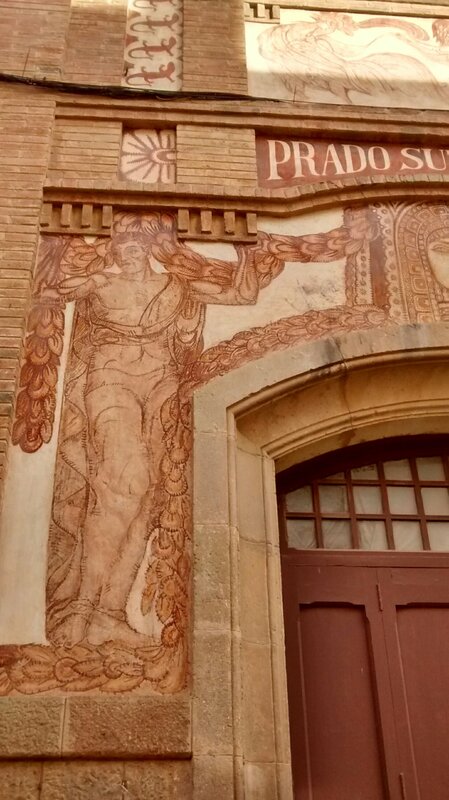 We stopped off in Berga on our way to Barcelona. 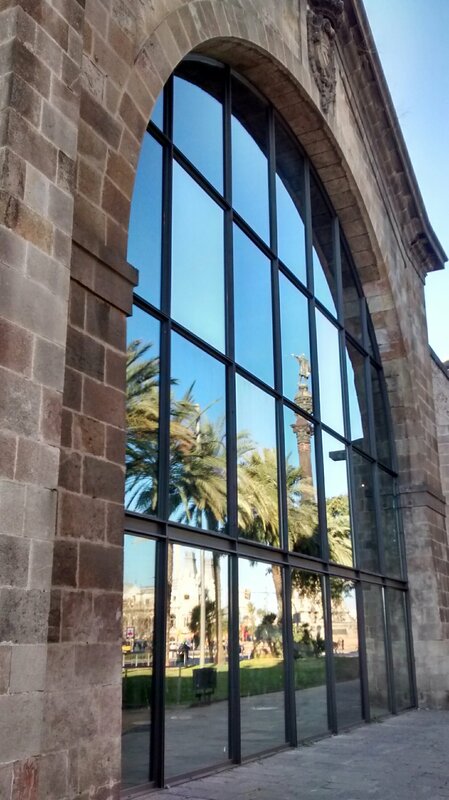 It’s a mediaeval city with a strong history of republicanism. In May 2012 for instance, the town council declared King Juan Carlos to be ‘persona non grata‘. Nobody’s likely though, to be keen on a king who goes elephant hunting in Africa as his country plunges ever deeper into recession. Now its cause of choice is Catalan independence. I’m not going into the arguments here. Though sauntering along various Ramblas on a September evening as friends and families pop into a bar for a drink, or to a restaurant for dinner, it’s hard to accept their definition of themselves as an oppressed people; or to take entirely seriously their view that they and, for instance, the Kurds, are all in it together. Mooch up and down the narrow alleys of Berga with us and look at the posters, the slogans, the street art which are such a feature of this town. A young man stopped me as I was snapping away. ‘We don’t all think that way here’ he said. But he admitted that he was in a minority . A Catalan MP suspended and imprisoned for his part in the illegal independence referendum of October 2017. Feminism and socialism are frequent bedfellows with the Independence movement. 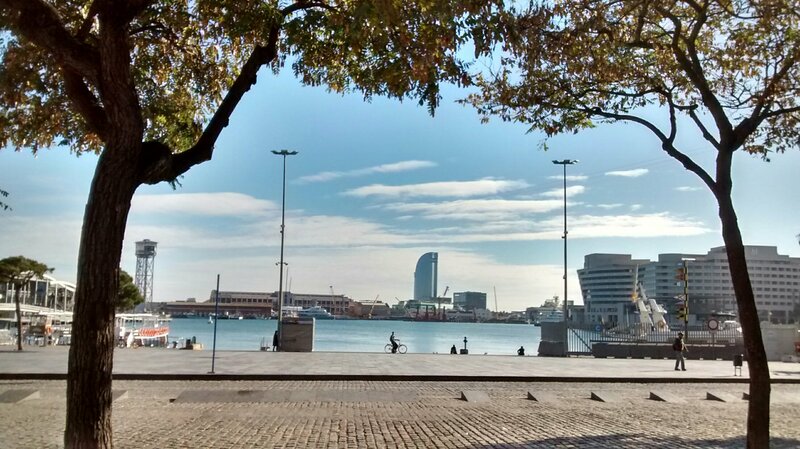 Author margaret21Posted on October 6, 2018 Categories Catalonia, Politics, SpainTags Berga, Catalan Independence movement12 Comments on Freedom for Catalonia! 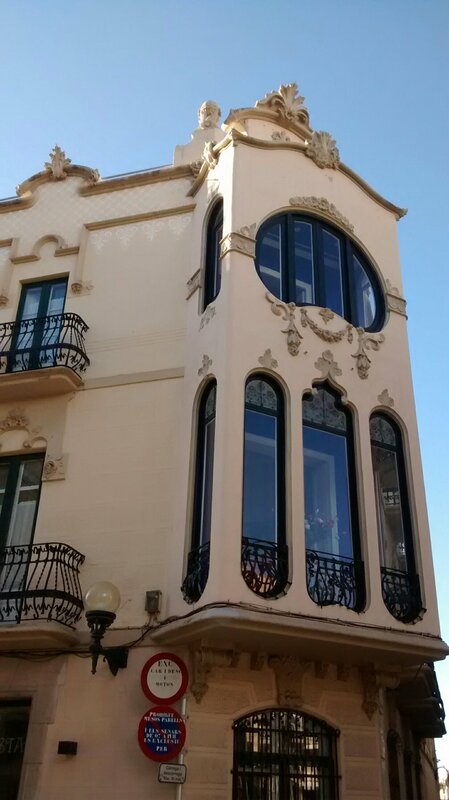 Last month, as faithful readers know, we had a day in Sitges. It was perfect. 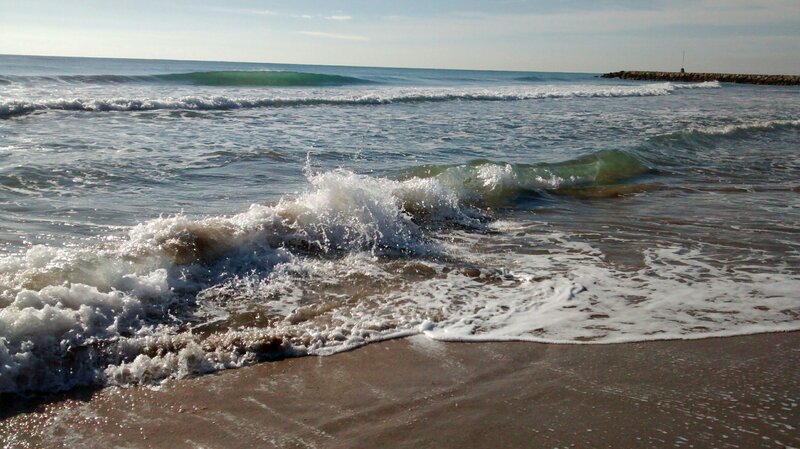 The sun shone, the sea sparkled, and we sauntered along its clean wide sandy beaches. All was not as it seemed though. In just five minutes, from the apparently uncontaminated sands, we recovered these: mainly plastic straws and bottle tops, many disintegrating into the shards and fragments now wreaking such havoc in our oceans. And this is a ‘clean’ beach. On a happier note, here’s a parakeet in a palm tree. The high prices of housing in this fashionable holiday destination don’t worry him. He has all he needs to build a home simply by fossicking around among the palm trees’ tall fronds. In response (sort of) to this week’s WordPress challenge, Variations on a theme. 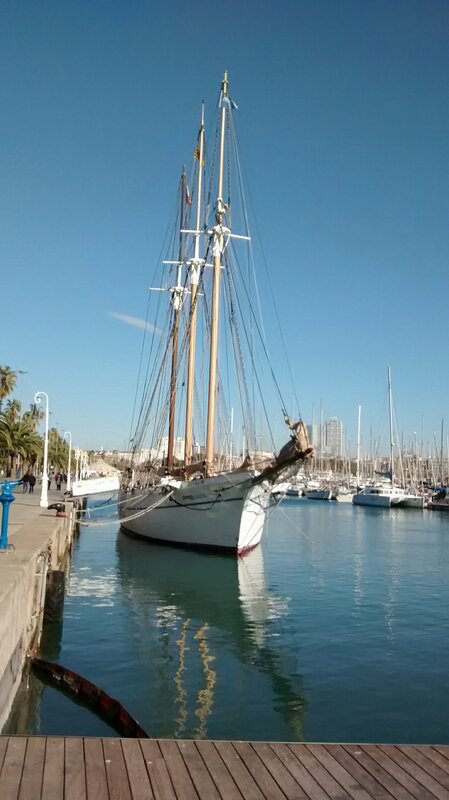 Another bright sunny day, so the seashore beckoned again – in Barcelona this time. 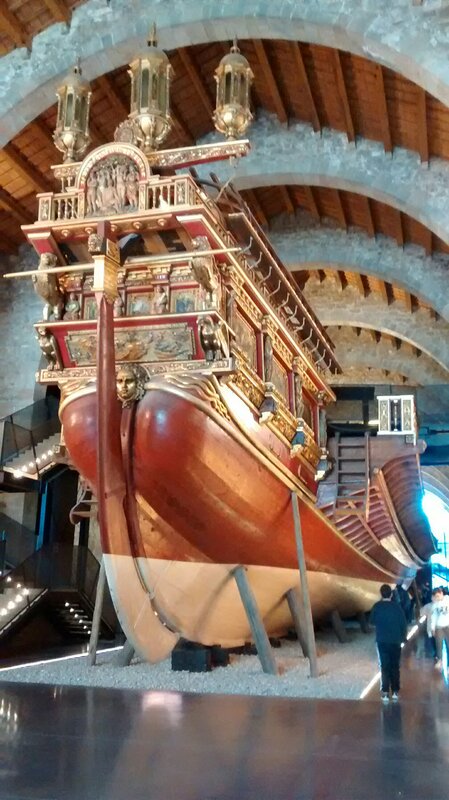 First though, we visited the Museu Marítim, located in the impressive Drassanes Reials, the mediaeval shipyard dating originally from the 13th century. It was remodelled time and again till the 18th century, when it fell out of use. 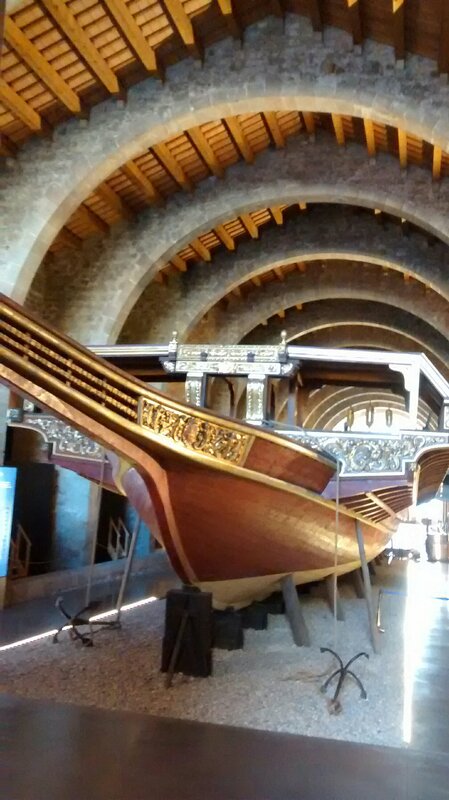 Our main memory of this engaging and beautifully curated museum is of the impressively reconstructed galley ship the Galera Reyal of 1568, and all the instruments, arms, ordnance and documents associated with such a warship. What about this? Thirty oars each side, each manned by four slaves. These men toiled for hours and hours each day, shackled to the same spot for the entire voyage. They worked, ate and slept here, puddled in their own excrement. A ship such as theirs could never surprise the enemy. The smell preceded it by several knots. The exquisite ornamentation of this vessel, rich in symbolism, loses some of its allure against this background. The whole of the dockyard area is rich in history. 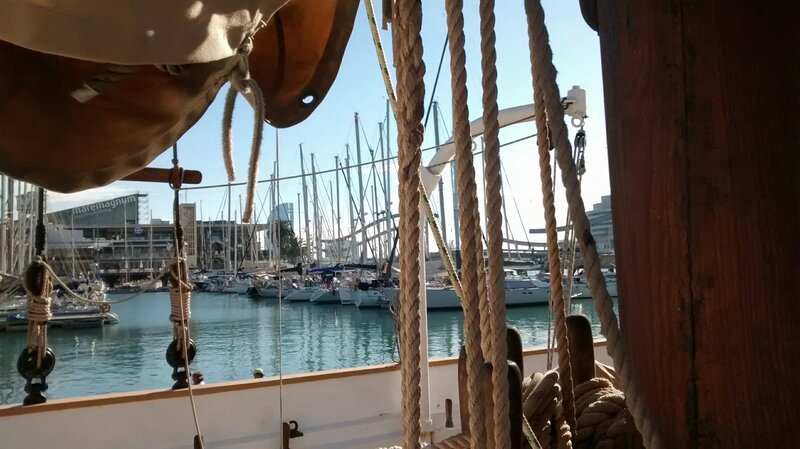 Here are just a few pictures, and from the more recently developed Port Vell. Top tourist tip. 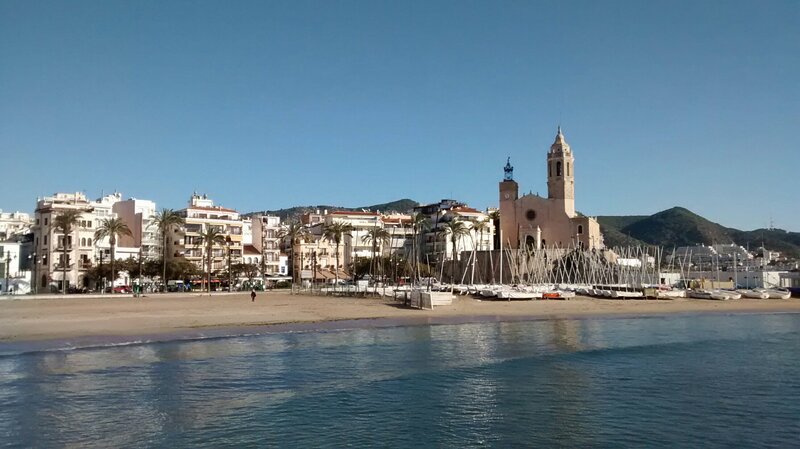 Visit Sitges, as we just have, on a bright day in January. You’ll have the place almost to yourself. We last visited a few years ago, when Emily took us to see the Corpus Christi Flower Festival in June. We could barely move for other people doing exactly the same thing. Today was different. 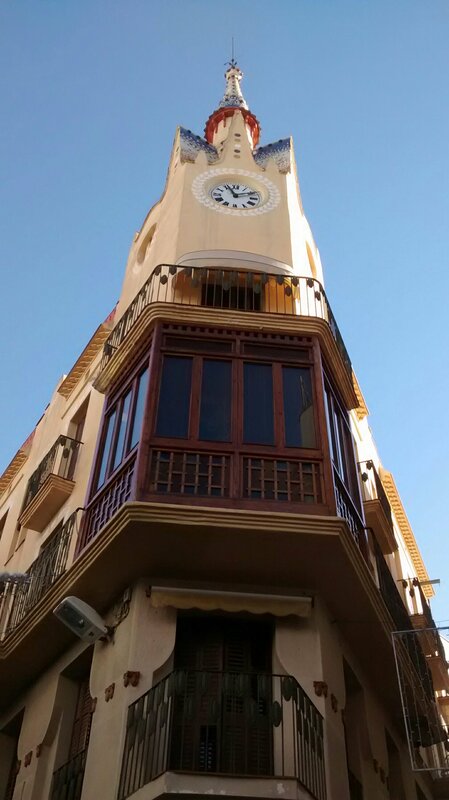 We mooched round enjoying the narrow streets of the old town, the Modernista buildings, and the wide sunny beach. I even paddled. Malcolm didn’t. A tasty tapas lunch was in a quiet bar in a quiet park. It was the perfect antidote to busy Barcelona, a mere half hour train journey away.